Let’s face it: running a small business is a job that has you constantly wondering, “why are there only 24 hours in a day? !” If you’re a small business owner, incorporating a marketing strategy into your already-hectic schedule may seem overwhelming. Social media marketing is the new face of small business marketing efforts. Not only are most of the platforms free of charge (perfect for small businesses with little to no marketing budget), but social media also enables a two-way conversation that’s conducive to many small businesses’ customer service goals. Social media is a wonderful way to create an online community and reach out to potential new clients and customers. As you might imagine, most of us are tuned into Facebook, with visitors spending almost 7 hours per month on the social media giant (tumblr holds the #2 spot, with 1.5 hours per visitor per month spent on the site). 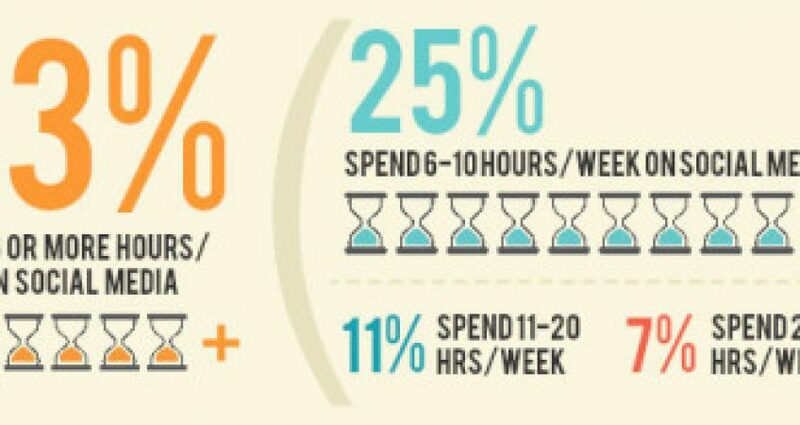 Mirroring the individual social media craze, 43% of small businesses spend more than 6 hours per week on social media, focusing primarily on Facebook (90% have a presence) and Twitter (70% have a presence). Depending on the industry and the type of business, as well as where the business falls in the lifecycle (startup, expansion, mature, etc. ), brands and businesses are also using Google+, Pinterest, YouTube, LinkedIn, etc. To be successful at social media, it is critical that you are posting and tweeting – on a daily basis – information that is relevant, meaningful, interesting, entertaining and engaging. Do this, and you have cracked the code: you are on your way to creating and building a solid foundation for social media success. And social media success = more revenues, more sales, higher brand recognition and stronger brand affiliation. And in terms of marketing dollars spent, we’re betting your social media platforms are costing you way less than any other form of advertising or marketing. So now ask yourself: what’s the reason I’m not pursuing a social media strategy? Not in the social media game yet? We can only say it so many times: you’ve gotta be in it to win it! If you’re not a social media player, there’s a good chance that your business is missing out on valuable opportunities. Feeling overwhelmed by the social media hustle and bustle? Let us take the hassle out of your hustle. Email us at info@echomarketingusa.com or give us a shout on 305.205.3315 to speak to our social media marketing team. Ms. Linning has been involved in social media and digital, integrated marketing since 2008. She is a seasoned professional with an extensive client list and she has significant experience developing social media and marketing strategies for an array of industries.